Sure, you could travel all the way to North Africa, but why would you when you can revel in an exquisite Moroccan experience in nearby Newport, instead? 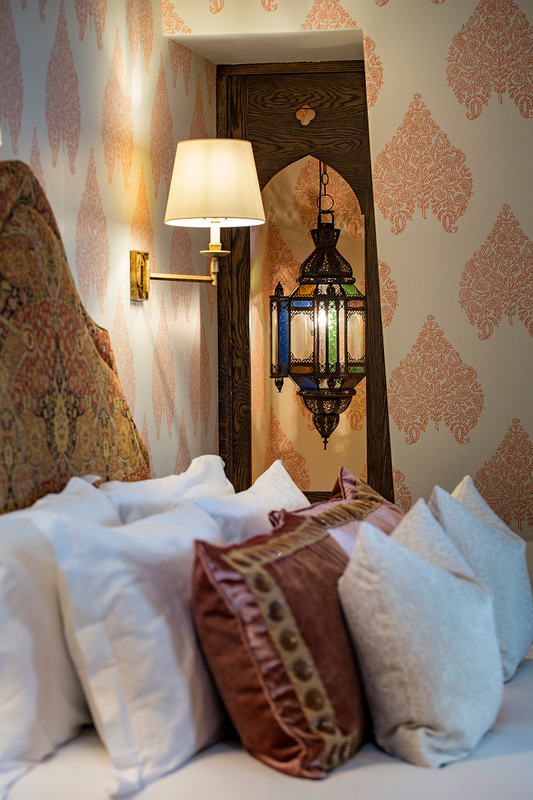 Guests who book a stay in the recently renovated Moroccan Room at The Chanler are transported to another dramatic destination -- no passports required. Here’s a closer look at what’s waiting for you in this gracious (and entirely unique) guest room. The newest addition to The Chanler’s suite of authentically-inspired abodes, the spacious Moroccan Room offers expansive garden views and an open-planned living space featuring interesting design elements, ornate furnishings, and small mementos which bring to mind the ambiance of a local souk. Luxurious upholstery and a vibrant color palette of deep oranges and rich reds evoking the shades of the Saharan sands and sunsets add to the room’s allures, while an impressive stone fireplace further enhances the atmosphere. And did we happen to mention the regal king-sized bed and en suite jetted double Jacuzzi tub? A host of cultural and culinary things to see and do awaits within easy driving distance of your haute home base. Just consult our customized itinerary to start planning your own magnificent Moroccan-themed getaway. From a morning at the rejuvenating bodhi spa soaking in the ancient art of hydrotherapy reminiscent of Moroccan hammams to an afternoon of perusing the 100,000 treasures of the bazaar-like Armory Antique Marketplace, a one-of-a-kind adventure is just around the corner (or at least not across an ocean and 5,000 miles away). Of course, you’ll need sustenance for the journey, and Providence’s extraordinary Tea in Sahara restaurant is just the place. Sip refreshing mint tea while you listen to eclectic music and feast on a traditional Moroccan meal -- bringing together the influences of Berber, Arab, Moorish, European and Mediterranean tastes and textures -- rooted in the owner’s own memories of the flavors, sounds, smells and tastes of his grandmother’s warm and harmonious cooking. When you don’t have time to sojourn to Africa, why not whisk away to Newport instead? A sumptuous stay is waiting at The Chanler’s remarkable Moroccan Room.